The good news: free colonoscopies for everybody! The bad news: they’re part of the new airport screening protocol. 6. Someone once said: “The nine most dangerous words are ‘I’m from the government and I’m here to help. '” Do you know who said it, and do you think it’s humorous? Image | This entry was posted in Government and tagged Health Care Deform, IRS, Obamacare, Satire. Bookmark the permalink. 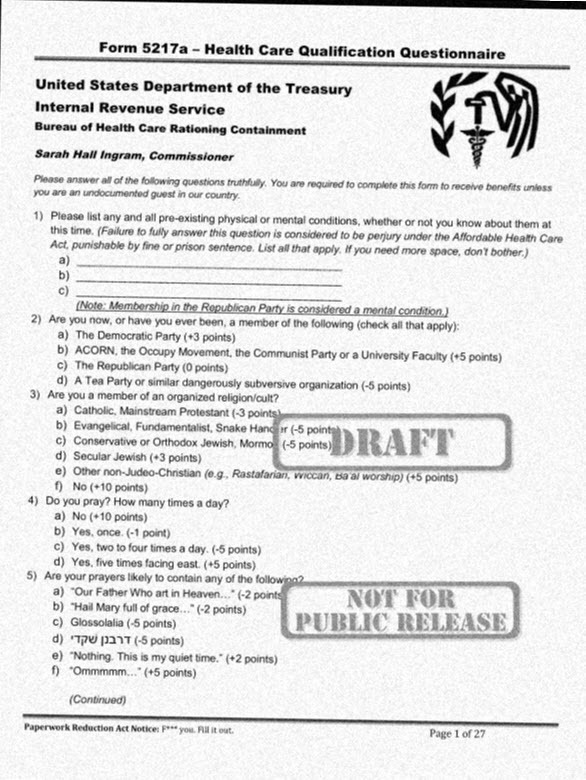 1 Response to Secret IRS Obamacare Qualification Form Revealed!! Gives me a chill, but not on my leg.